WHAT KINDS OF FISH ARE WE GOING TO CATCH TODAY? Here is a guide for a typical year of Chesapeake Bay Fishing aboard the "Double D."
Trolling for trophy Rock fish, 28" or larger - 1 fish per person. Night / Bottom fishing will begin in late May for Big Hard Heads and Big Trout. Limit for Rock fish changes to 2 per person, 18" to 28" or 1 fish 28" or larger. Night / Bottom fishing continues for Big Hard Heads and Big Trout. Spot fishing will also begin. Rock fish, Hard Heads, Trout, Spot fishing available. Rock fish, Hard Heads, Trout, Spot, Blue, Mackerel, and Flounder. Night fishing usually ends during the middle of August. Rock fish, Trout, Blue, Mackerel, and Flounder. Beginning half of the month: Rock fish, Hard Heads, Trout, Spot, Blue, Mackerel, and Flounder. Trolling for large Rock fish, Trout, and Blues. 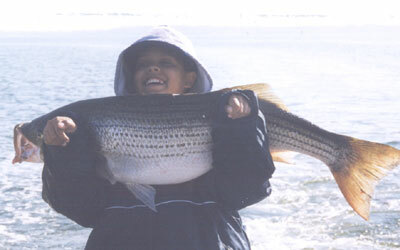 Fishing the Chesapeake Bay in Virginia for large Rock fish.